Your commute to work can be so much more than fighting traffic. Gohio Commute, a program of the Mid-Ohio Regional Planning Commission (MORPC) will help you rethink your ride.  Our platform equips commuters and companies with resources to help them explore the many commuting options available in Central Ohio. Take some time to explore the different ways you can commute, and how your ride can improve your health, save you money, and even help you be more productive. No matter how you go, Gohio Commute can help you find a smarter way. Downtown C-pass provides eligible downtown Columbus workers unlimited access to the entire bus system of Central Ohio Transit Authority (COTA) thanks to the partnership of the Mid-Ohio Regional Planning Commission (MORPC), COTA, and Capital Crossroads Special Improvement District (CCSID) downtown property owners. Use the C-pass any day, any time, on any route. The Emergency Ride Home (ERH) program is a free service that assures commuters they won’t be stranded at work in the case of an emergency. Skip the hassle of competing for downtown parking. Bike into downtown Columbus from one of the free and convenient Park & Pedal locations.